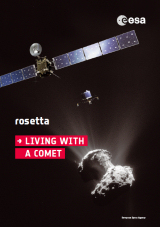 Rosetta is ESA's comet-chasing mission to 67P/Churyumov-Gerasimenko. Launched on 2 March 2004, the spacecraft travelled for 10 years and required three gravity-assist flybys at Earth and one at Mars before homing in on its target. Comets are time capsules containing primitive material left over from the epoch when the Sun and its planets formed. By studying the gas, dust and structure of the nucleus and organic materials associated with the comet, via both remote and in situ observations, the Rosetta mission could be the key to unlocking the history and evolution of our Solar System.